Skiing through a wintery landscape, you see tracks from animals crossing your path. A grouse – or was it a hazel grouse?– suddenly flies up in front of you, aware of your presence and not trusting its hideout in the snow. 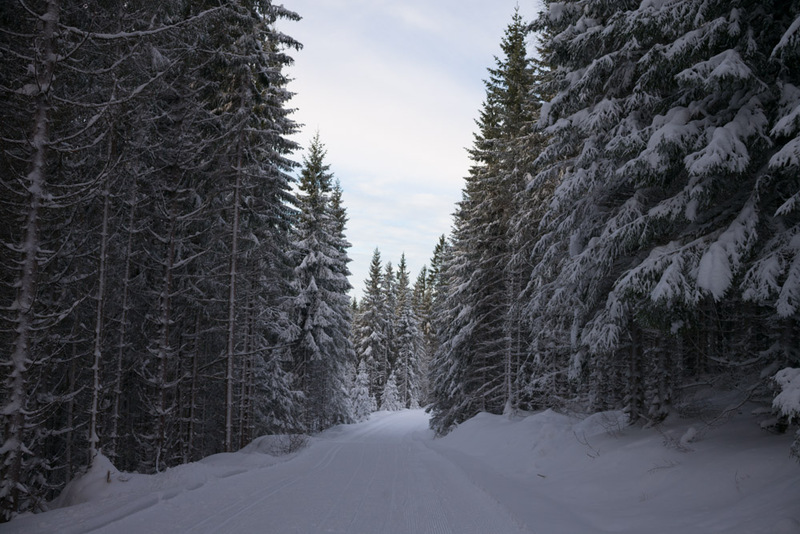 Giant fresh footprints of moose, a mother and a calf, zigzags across your trail several times, and you half expect them to stand there behind the snow-covered spruce, watching you. The tracks of a hare and a fox cross each other, telling a tale of a dramatic hunt. Norwegian winters are traditionally harsh. Storms sweeps in from the North Sea, snow covers roads and fields and nothing grows. Climate change is about to start giving a different, less stable pattern. Still, as for now, temperatures are often below zero and snow is still a common thing in the lowlands between December and March. We are happy for the snow. It makes the dark winter months much brighter. 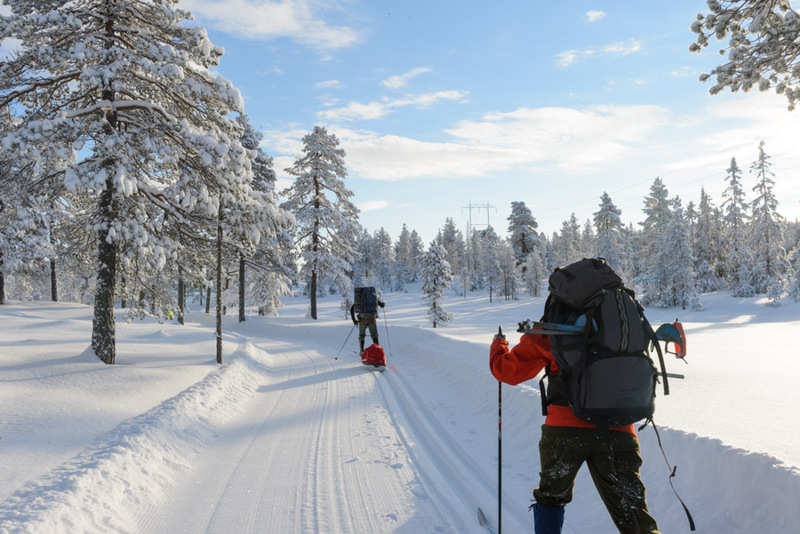 It gives us the chance to use skis and sleighs, and keep active even when it’s cold and dark. And it puts nature peacefully to rest. There is a silence in the woods that you never find in other months of the year. No birdsong, no insects, hardly a whisper by the wind in the snow-covered trees. The trip is long. We meet in the heart of Romeriksåsene, a forest area North-East of Oslo. Some of us took the train early in the morning, and walked between seven and twenty kilometres to get to the cabin that was our meeting point. Friday was cold and sunny, but today, a Saturday, comes down with a heavy snowfall and temperatures just below zero. The snow is heavy, and the ski trail hasn’t been prepared. Knee-deep in snow, you feel how every step drains you of your energy as you cross the frozen lake Råbjørn. Eyeing the cabin in the distance, you catch the scent of a campfire and your imagination goes wild. What would be the best thing to sink your teeth into right now? As you soldier on through the snow, your appetite turns into hunger. 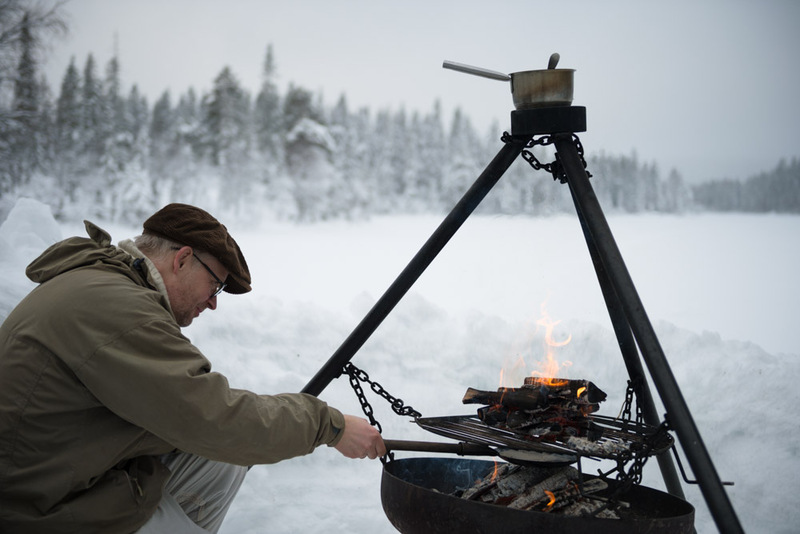 Managing the campfire is Food Studio’s main forager, Jan Svartsund. Watching the arriving skiers crossing the frozen lake, he sympathises – he came the same way the day before, pulling a sled containing all necessities for the event. As a part of the advance team, he is preparing a treat for the arriving guests: pancakes fried in the fire and served with bacon and a hot sauce containing honey, sour cream and prim, a mixture of caramelised whey and cream with a consistency and taste comparable to dulce de leche. 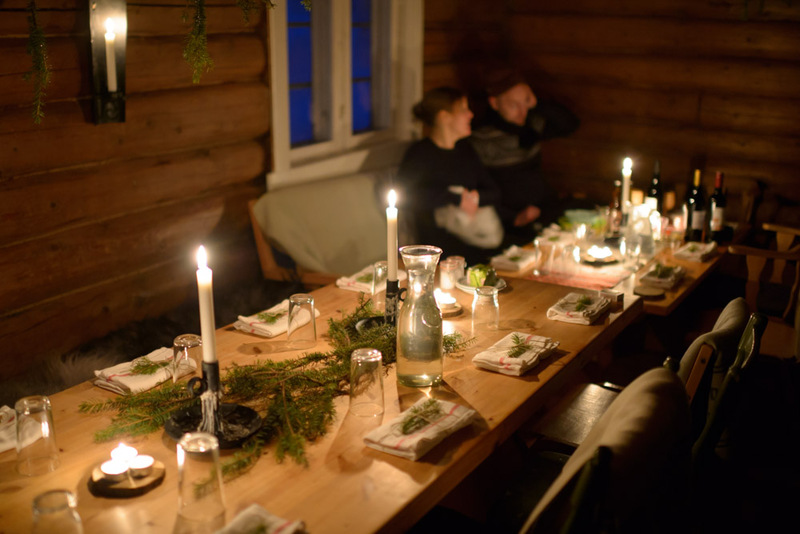 Together with a cup of hot, spiced non-alcoholic malt beer (called vørterøl in Norwegian), this meal might not be far away from the food that the lumberjacks who used to inhabit this cabin had after a long day in the woods. Råbjørnhytta, as it is now called, was a shelter for the men who had logging as their profession. The lumber in the forest was an important means of export. In the early 19th century, Romeriksåsene was still an area so remote that it took days to get there from the nearest towns. Thus, the lumberjacks lived in cabins and worked for a number of weeks while getting a few weeks off. Horses were used to transport the lumber down to the nearby Råsjøen, where it was cut and made ready for further transport. In the 1960s, most landowners had built roads that enabled their workers to venture in and out of the woods in a day. The cabins became obsolete, but many gained a new function: as recreational skiing became more popular, there was a need for places to sit down and rest, preferably with a warm stove, hot food and drinks. Råbjørnhytta was well accommodated for such purposes, and for a few decades, local skiers could enjoy a hot cup of toddy and a waffle in here on wintry Sundays. After a while, however, the cabin was sold to the boy scouts’ association and gradually fell into disrepair. In 2006, conditions were so dire that it could no longer be used. 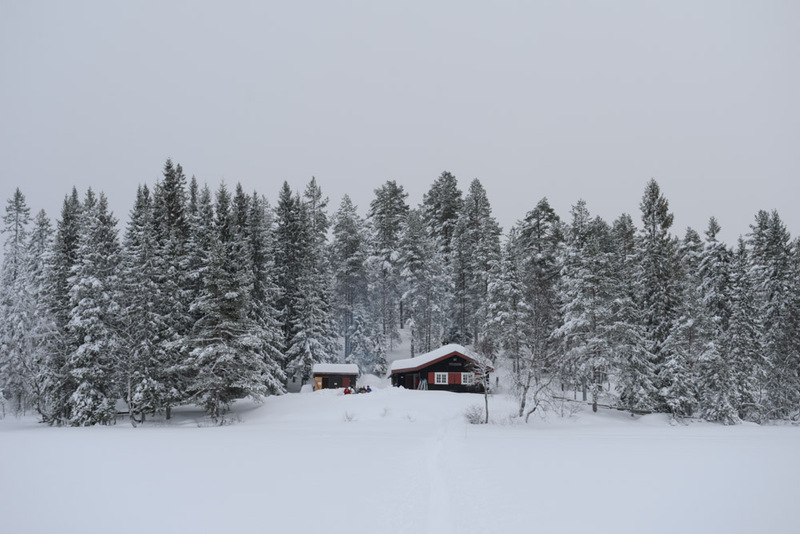 Luckily, The Norwegian Tourist Association (DNT) took it upon them to fix it up and use it as one of 25 cabins in the forests surrounding Oslo. It is now possible for everyone to rent Råbjørnhytta for one night or more, to cook food and enjoy the silence that surrounds the beautiful landscape by the lake. It is a well-known fact that food tastes better in the great outdoors. After changing clothes and swallowing down pancakes like ravenous lumberjacks, we all start working on what is to become our supper. Everything is taken from nature, in principle from what can be found or foraged in the woods. Fish, for instance. 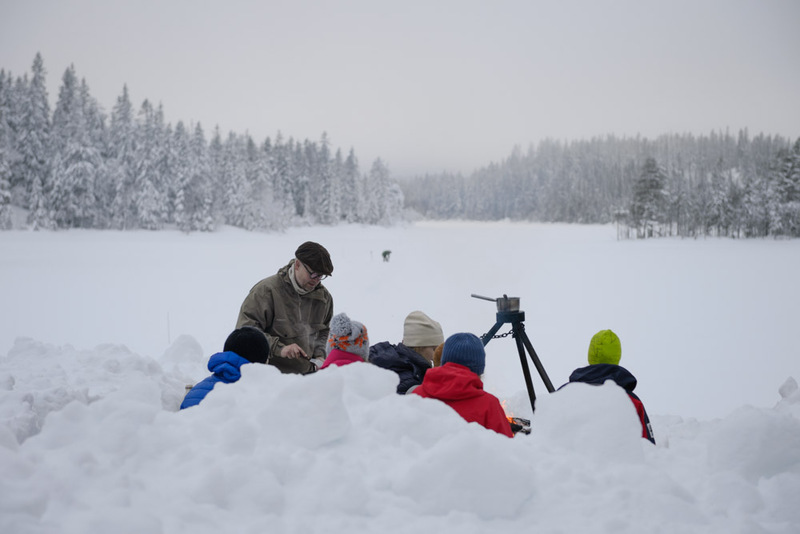 The lake Råbjørn is known for its array of perch, pike, and trout – and ice fishing is one of the best ways to forage in the wintertime. At least in theory. In practice, it turns out to be – ahem – a red herring. Ice fishing requires patience more than anything, but after a few hours drilling holes in the ice and idling about with our fishing rods, we give up and withdraw to the hot campfire. Luckily, other workshops have been more successful in their tasks. In the kitchen, a large boiling pot fills the room with a scent of broth. Some guests have been let in and are wrapping beetroot in clay for cooking in the fireplace. 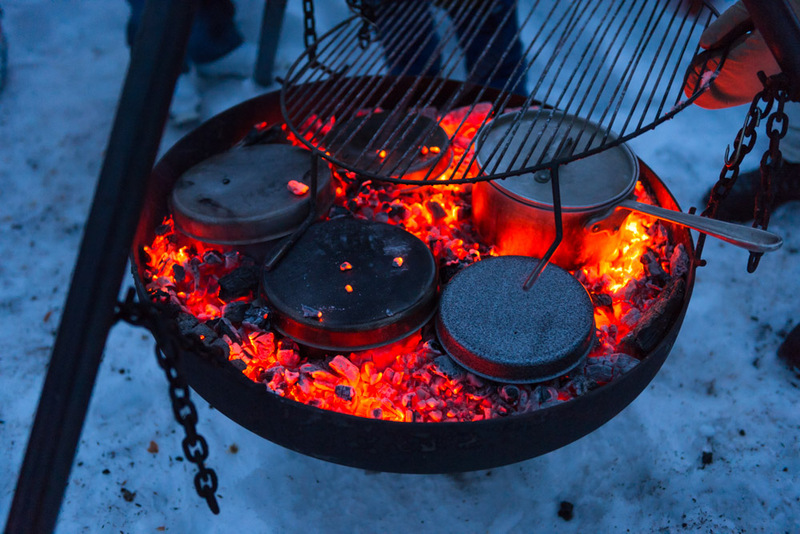 Others, still outside in the cold, are baking bread by putting the dough into Trangia stoves that, in turn, are dug into the ember of the campfire. Everyone’s in activity, keeping warm by the fire and building up an appetite for supper. Finally, it is completely dark. The clouds vanish, revealing a moonlit, starry sky. The forest grows colder, quieter. We all go inside, carefully taking our boots off in the hall before entering the warm, timber-walled and neatly decorated room. The menu is presented: it seems likely that we won’t have to go to bed hungry, despite the unlucky fishing experience. – All survival guides tell you to find your way to the coast during winter, says Jan Svartsund, who has spent considerable amounts of time and effort to compose the menu. 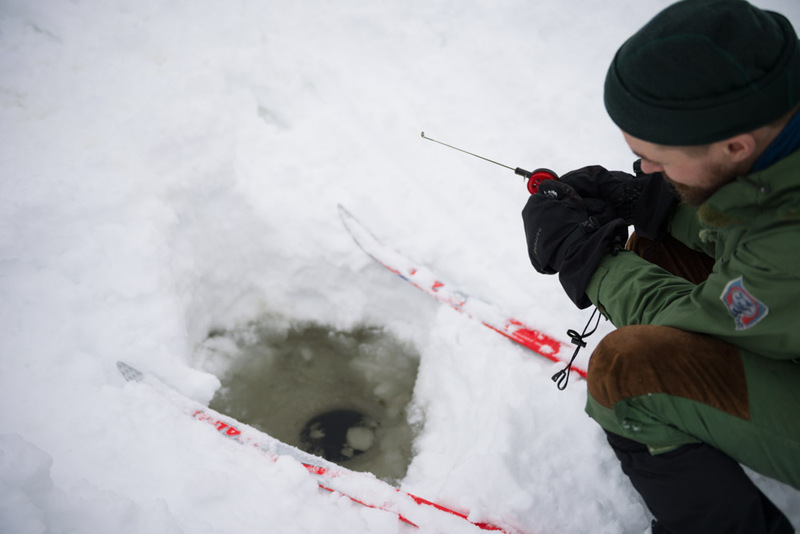 – If you have to stay in the woods, and can’t catch any fish under the ice, go after the larger birds. You might not get hold of the birds themselves, but they might show you the way to a carcass of an animal that you can eat. One great advantage in the cold is that preservation of food is easier, he says. We didn’t have to scavenge from a dead animal, but the moose that made up the main part of our meal, had been shot by a local hunter. We ate its marrow and cooked a good broth from its bones, a strengthening soup that made the colour come back to our cheeks. The clay-cooked beets made another dish, deliciously served with butter that we churned by hand while waiting in front of the stove, and with pieces of salted bream. And for dessert: snow ice cream. Yes, it’s that easy, and it’s just as good as it sounds – all you have to do is to stir in cream with immaculate, white snow. Add sugar to taste, perhaps some home-made apple jam: and voila! 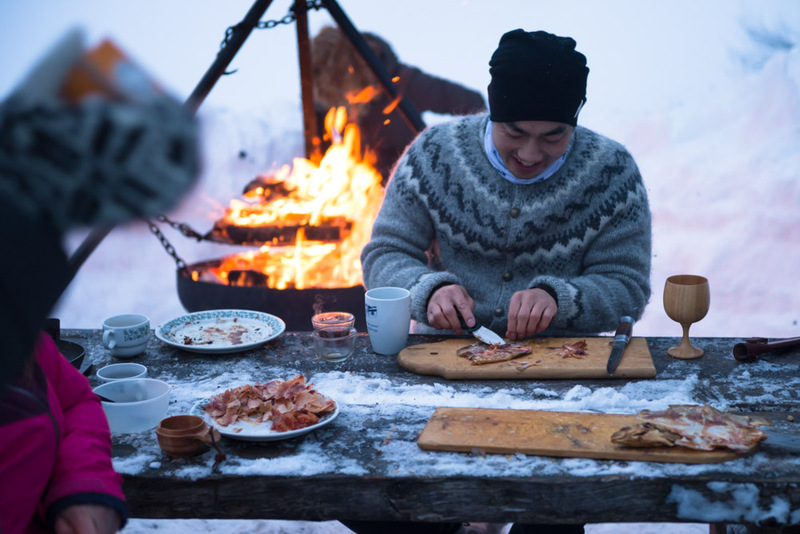 It is the perfect ending to a meal served in nature for hard-working skiers. All good things must come to an end, however. Some of us are going back to Snellingen, another DNT-owned cabin some seven kilometres away. With fresh trails, it will be an hour and a half in the moonlight, a quite pleasant way to digest a hearty meal. The others can look forward to a good night’s rest, assured that their trip back to civilisation will be made easier by both the cold, clear weather and their goodbye gift: A silk escape map, similar to the type that Allied pilots wore around their necks when flying over enemy territory, to find the most convenient (or the longest, depending on how strong they feel in the morning) way home. Have a look at the event here and make the recipes yourself.